UPDATED: Thu., Feb. 7, 2019, 10:44 p.m.
Zach Norvell Jr. hit a corner 3 to get the crowd roaring with 2 minutes left in the first half, then Brandon Clarke nabbed a wayward pass and found Norvell for a layup and a nine-point lead. The Kennel erupted and San Francisco called a quick timeout. 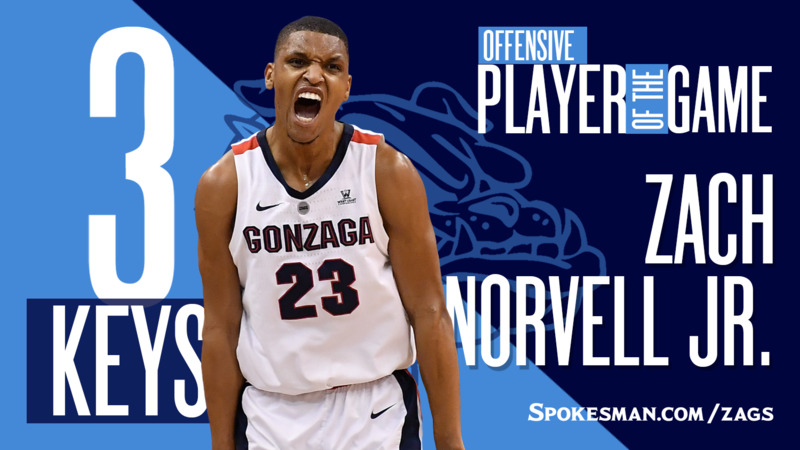 Norvell was the spark plug late in the first half for the Zags. The sophomore guard scored 16 points with two assists and no turnovers. He also stretched the floor, going 3 for 5 from long range and drove the lane hard multiple times, finishing strongly at the hoop. How about the new single-season blocks leader for the Zags? Clarke passed Austin Daye, who held the record since the 2008-09 season. Clarke finished with five blocks, and his 16 boards are the most in McCarthey Athletic Center history. Published: Feb. 7, 2019, 8:09 p.m. Updated: Feb. 7, 2019, 10:44 p.m.